Download Hour1 Download Hour2 This week, Jeremy Scahill unmasks the fiction of journalistic objectivity, and another reading from Power & Powerlessness. I don’t believe it’s possible to be neutral. The world is already moving in certain directions. Wars are going on. Children are starving. And to be neutral, to not take a stand in a situation like that is to collaborate with whatever is going on, to allow it to happen. 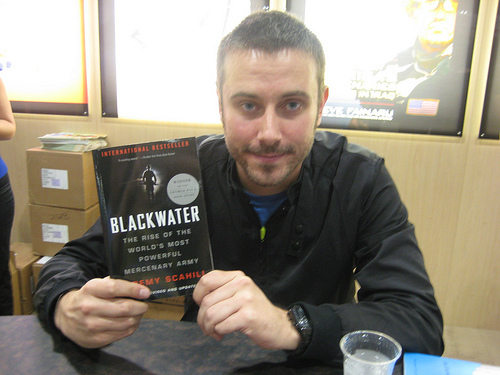 Journalist and author Jeremy Scahill is clear about what his role as a journalist is - to interrogate power and lay bare the truth, and he is concerned that the alternative media which took such a strong stand during the Bush years exposing the lies and crimes is at risk of becoming what he calls a blue state Fox during the Obama years. He spoke of this and more on 2008-12-02 at the Park Center for Independent Media in Ithaca, New York, and we're going to hear his talk and audience discussion in the show this week. We conclude with the next instalment of Power and Powerlessness. This page was last modified on 7 October 2010, at 04:06.